I’ve been divorced a long time and have done online dating for about 12 years. Had two great five-year relationships (met them both on match.com), but before and in-between them, online dating seemed like the only viable way to find “the man of my dreams” — since I don’t feel comfortable in bars (and refuse to drink and drive) and I’ve been a single mom since my son turned four. Over the years, I think I’ve met nearly every strange single man within 50 miles. My married girlfriends always loved to hear my dating stories, so I’ll share a few of them with you here. About seven years ago, I got an email on one of the dating sites from an extremely good-looking man who was slim and had dark hair. His profile said he lived about 90 miles away, but he was really a “hottie” and he did write to me first… so I broke my self-imposed “must live nearby” rule and wrote back. We corresponded a number of times, but it wasn’t long before he revealed that he was employed as AN ELVIS IMPERSONATOR! I’m pretty conservative and have never even seen an Elvis impersonator. Truthfully, I was horrified and fascinated at the same time. 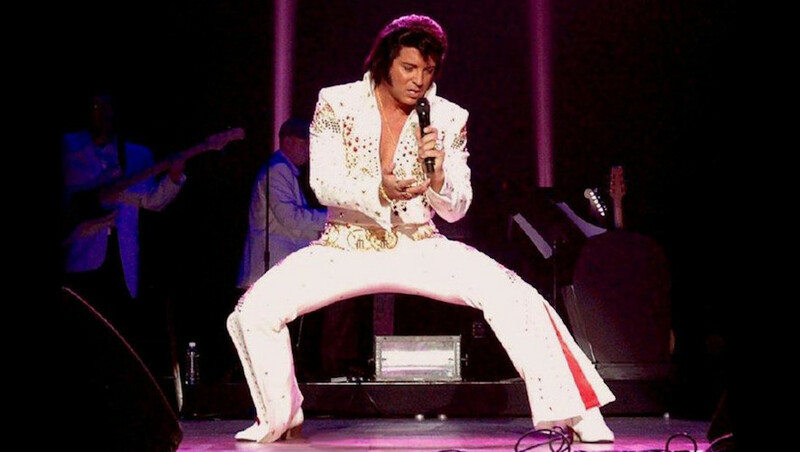 What kind of guy would dress up like Elvis, swivel his hips, and sing old Elvis songs for a living??? And why in the world had he seen my photo and contacted me? After several messages from “Elvis” — real name David — I could see a pattern. They were all about him, his life, his job, his family, his ex-wife, his future, on and on and on… He never asked one single question about me. And when I wrote about things in my life, he never commented on any of it at all. Fairly early on, he asked for my mailing address to send me something. It wasn’t a smart move, but I gave him my address, and soon received a big brown envelope stuffed with promotional literature — a full brochure and flyers about himself as Elvis! He also sent me a CD and a URL to a website that contained more detailed promotional info and featured him singing several Elvis songs. It was all very entertaining — and made a great story for my friends — but after a while, enough was enough. I finally emailed him and said I wouldn’t be writing any more because we didn’t seem to be a good match. However, I had to be ultra-careful and super tactful since he had my home address. I figured that would be the end. But, no, the self-centered, egotistical jerk wrote back and oh-so-innocently asked why I thought we weren’t compatible. After careful deliberation, I responded by saying it didn’t feel like he was interested in my life, because he never asked me any questions about myself. Again, I figured that would be the end. But “Elvis” wrote back promptly and seemed genuinely hurt. At this point, a normal man would’ve tried to prove his interest in me as a person, right? Ask a few questions to try to get to know me better? Nope. He STILL DIDN’T ASK ANYTHING ABOUT ME OR MENTION MY LIFE AT ALL! That really was the end. But I’ll always have the memories of “Elvis” (envisioning him combing his hair and smiling with satisfaction at himself in the mirror)… and pray that he doesn’t show up at my door some day. Good call on ending it!